Robert Fordyce Aickman (1913-1981) was a British author of stories he himself best described as "strange". 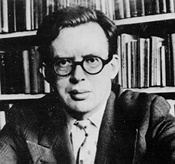 The grandson of Victorian novelist Richard Marsh, Aickman won the World Fantasy Award in 1975 for his short story "Pages from a Young Girl's Journal". Aickman has enjoyed a devoted, but sadly, rather small following over the years. While Aickman had received schooling in his father's profession, architecture, his real interests were more cosmopolitan: literature, music, ballet and theater. These diverse interests kept him busy as critic, lecturer, and organizer. He served on many boards and panels, and was an avid traveller. He also edited the first eight volumes of the Fontana Book(s) of Great Ghost Stories. In his Who's Who in Horror and Fantasy Fiction, Mike Ashley notes that Aickman's Fontana selections were "impeccable". Perhaps Aickman's greatest legacy will be his co-founding of The Inland Waterways Association, a group devoted to restoring and preserving England's inland canal system. Eleven collections of Aickman's "strange stories" have been published, of these, eight are original collections and three reprint collections. Two novels and two volumes of autobiography have been published. Only four of Aickman's books have been published in the United States, and even in his native England, he has been out of print for years. NEWS: Robert Aickman returns to print! Nearly a decade has passed since Aickman's last book (a reprint volume) was released. Now plans are afoot on both sides of the Atlantic to present the "Collected Strange Stories" of Robert Aickman. While both editions will be the same in that they will contain the complete short stories, the format of the two will be different. More details below, near the bottom of the page. NOTE: I'm trying to put together a comprehensive list of Aickman's books, and would like to hear about any editions I don't have listed here. UK paperbacks are of special interest. Please feel free to contact me with any information. Thanks! WE ARE FOR THE DARK: SIX GHOST STORIES. London: Cape, 1951. NOTE: Three stories (*), by Elizabeth Jane Howard, with Aickman's collaboration. Additional edition- London: Mayflower/Dell, 1965. KNOW YOUR WATERWAYS. London: Coram, 1954. NOTE: Non-fiction title. At least one "revised" edition was also published. THE STORY OF OUR INLAND WATERWAYS. London: Pitman, 1955. DARK ENTRIES. London: Collins, 1964. NOTE: Two printings in 1964 of the Collins edition. Additional edition- London: Fontana, 1964 & 1965. THE LATE BREAKFASTERS. London: Gollancz, 1964. Novel. NOTE: Additional edition- London: Portway/Chivers, 1978. POWERS OF DARKNESS. London: Collins, 1966. NOTE: Additional edition- London: Fontana, 1968. THE ATTEMPTED RESCUE. London: Gollancz, 1966. Autobiography. SUB ROSA: STRANGE TALES. London: Gollancz, 1968. COLD HAND IN MINE: STRANGE STORIES. London: Gollancz, 1975. NOTE: Additional editions- New York: Scribners, 1977. New York: Berkley, 1979. London: Robinson, 1988. The Scribners edition features a nice dust jacket by Edward Gorey. Also issued in a "Book Club" edition. TALES OF LOVE AND DEATH. London: Gollancz, 1977. PAINTED DEVILS: STRANGE STORIES. New York: Scribners, 1979. NOTE: No UK edition of this title. Very nice dust jacket by Edward Gorey. Also issued in a "Book Club" edition. INTRUSIONS: STRANGE TALES. London: Gollancz, 1980. NOTE: Last title published in Aickman's lifetime. NIGHT VOICES: STRANGE STORIES. London: Gollancz, 1985. THE RIVER RUNS UPHILL: A Story of Success and Failure. Burton-on-Trent: Pearson, 1986. Autobiography. THE MODEL. New York: Arbor House, 1987. Novel. NOTE: Additional edition- London: Robinson, 1988. Aickman had hoped to have this published with illustrations by Edward Gorey, alas the publishers never followed through. THE WINE-DARK SEA. New York: Arbor House/Morrow, 1988. NOTE: Issued as a "Book Club" edition in paperback (large format). THE WINE-DARK SEA. London: Mandarin, 1990. THE UNSETTLED DUST. London: Mandarin, 1990. THE COLLECTED STRANGE STORIES. London: Tartarus/Durtro, 1999. Note: The complete short stories, contents as per the above collections. Two volume limited edition of 500 copies. As stated above, two editions of THE COLLECTED STRANGE STORIES will be issued, a UK and a US edition. The first printing of the UK edition has gone out of print, but a second printing has been issued and is still available. The US edition is being published by Old Earth Books. This will be a two volume hardcover set. The print run is planned to be around 2000 copies, with publication perhaps sometime in 2001. This edition will also include Aickman's short novel The Model as well as some non-fiction items such as the introductions Aickman wrote for the Fontana selections he edited. GO BACK AT ONCE. Book.